When you practice the following, concentrate on the mooladhara chakra at the base of the spinal column, which is triangular in form and which is the seat of the kundalini shakti. Close the right nostril with your right thumb. Inhale through the left nostril till you count three Oms slowly. 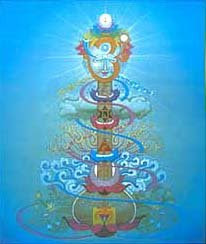 Imagine that you are drawing the prana with the atmospheric air. Then close the left nostril with your little and ring fingers of the right hand. Then retain the breath for 12 Oms. Send the current down the spinal column straight into the triangular lotus, the mooladhara chakra. Imagine that the nerve-current is striking against the lotus and awakening the kundalini. Then slowly exhale through the right nostril counting 6 Oms. Repeat the process beginning with the right nostril as stated above, using the same units, and having the same imagination and feeling. This pranayama will awaken the kundalini quickly. Do it thrice in the morning and in the evening. Increase the number and frequency gradually and cautiously according to your strength and capacity. In this pranayama, concentration on the mooladhara chakra is the important thing. Kundalini will be awakened quickly if the degree of concentration is intense and if the pranayama is practised regularly.